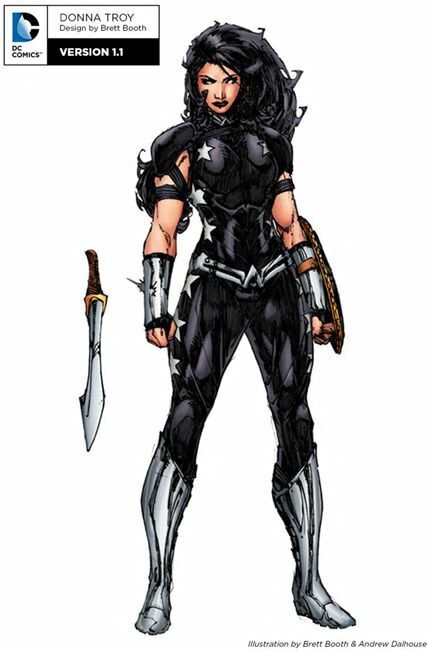 What do you think of Donna Troy's Rebirth design? Um...Before I vote, quick question...Why is she wearing Aquaman's Belt Buckle? Why? Well, I take it Pod isn't the only one to have been swapped. I like this one. It's actually a pretty clean update to her "Titans" era look from the 90s, taking cues from previous designs but also adding a bit of armor to reflect this version of the character. As for the belt, it's not clear in this artwork, but there's no separate buckle for the belt, it's just a long "W"
3: It's fine. It looks pretty good, and, as 'Mato said, the armored look actually makes a certain amount of sense. The belt is a neat idea but doesn't quite work, and superheroes armed with swords are thematically problematic, but that's not really a costume issue. The black looks pretty good, though I rather miss the red. In isolation, this costume is good, but for an Amazonian warrior, I feel like it could use more ancient elements. Of course, I have no idea what is going on with the character now, so perhaps that isn't valid. Well Benton, the thing about that is... Donna's only been in the n52/Rebirth continuity for a couple years, and she already has conflicting origin stories per character tradition. Generally speaking, she was a weapon created to kill Wonder Woman that Diana and the Amazons recently stopped and gave a new life and memories to so she could have a normal life... but despite this she was also somehow a member of the original titans during their fight with Mr. Twister prior to her mind wipe. In either case she's not REALLY an Amazon, but yeah... different verse, same as the first as it were. Edit: So I was basing what I knew mostly on the Titans Annual, but it's actually a bit more complicated than that? Apparently her stuff with WW was resolved by Donna turning good and later becoming the replacement for the Greek fates, and it was the Titans Annual that retconned in the wrinkle of the amazons wiping her memories to give her a more stable life. I really like this. Even considered a love but it needs just a little extra something to get there. The black on silver is a good colour scheme and the stars help keep it looking generic. The shoulder guard looks pretty cool too. On the negatives the belt looks strange, and the gold on the weapons doesn't look like it probably doesn't fit - but I'd need some more pics to be sure. superheroes armed with swords are thematically problematic, but that's not really a costume issue. I know where you're coming from but comics are filled with characters using dangerous weapons, even classic characters like Hawkman and Black Knight. Even her teammate Arsenal, who I ran last week, is using a bow and arrow. Yes, but the archer characters traditionally used blunted or trick arrows and you can imagine a blunt weapon, like a mace, being nonleathal, while there isn't much of a way to make a sword non-lethal. Of course, in real life, maces are super deadly and destructive, thus their usage as, you know, weapons, but it works in comics reasonably well. Black Knight is one of the very few examples of a classic character armed with a sword, and that made him rather limited back in the day if he wasn't fighting robots or the like. Four words on making swords non-lethal: flat of the blade. While I don't have anything against any specific thing on the costume, this drawing of it makes her look like she should be playing football. I'll give it a like, but I agree with GG, those Shoulder pads are Kind of off. Maybe if they were a separate color or something to help them stand out? And I still say she swiped Aquaman's Belt Buckle. Deal with those two issues, and I think the Costume would be great. Not bad. I'd ditch the shoulder pads and change the colour of the outfit to blue/navy blue to contrast better with her black hair.